Although they may be technically a ‘fruit’, you definitely don’t want to bake these into desserts or worst of all, eat them raw! Famously bitter, the culinary world has firmly cemented its reputation as a vegetable, alongside its fellow nightshade fruits, tomatoes, peppers, and okra. Versatile and full of flavor; they are delicious fried, stewed, stir-fried, braised, baked, stuffed, roasted, and even pureed. 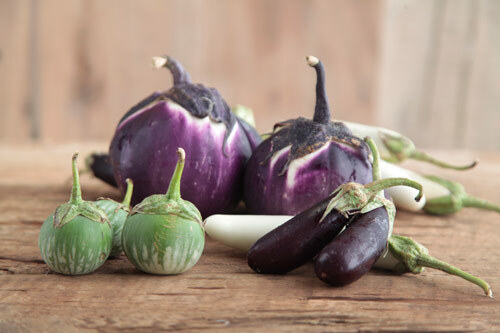 While you may immediately associate eggplant with ‘eggplant parmesan’ and the Italian peninsula, eggplant is truly and originally an Indian native. 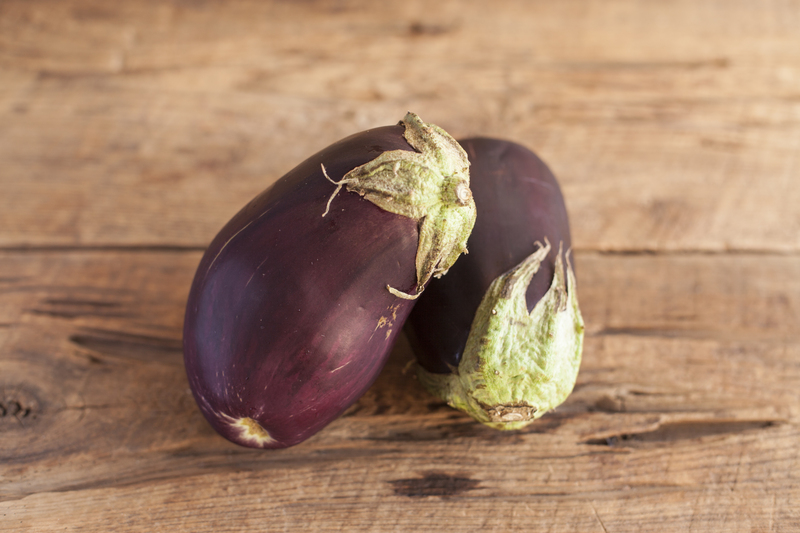 In fact, to this day Indian people refer to eggplants as ‘the King of Vegetables’! Cultivated there since prehistoric times they spread throughout Southeast Asia and eventually up into Muslim world, where during the middle-ages they began to trade disperse these delicious veggies with Mediterranean traders. 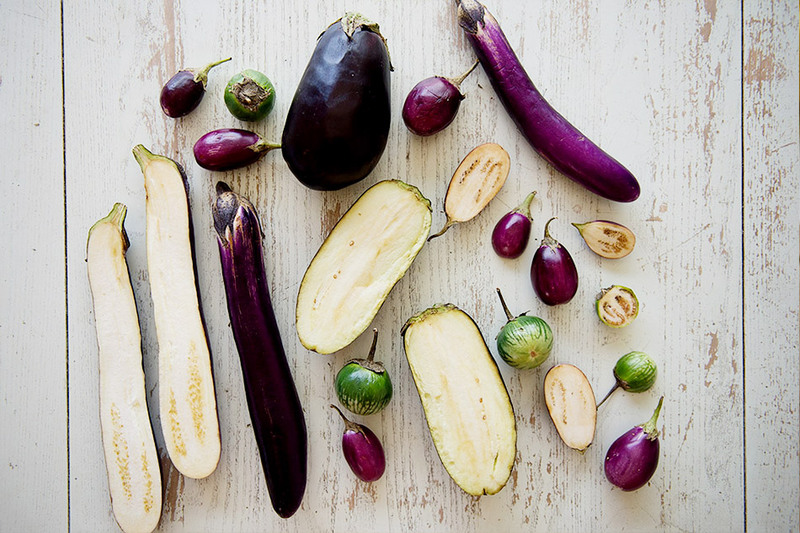 So why do we call this ancient veggie ‘Eggplant’? Well, most of the world (for most of its history) actually hasn’t called it eggplant at all. Since they first entered history, these little veggie-fruits have had as many names as they’ve had colors and sizes. These names, just like the veggies themselves, have traveled across borders and through cultures, being shaped and changed a little each time. 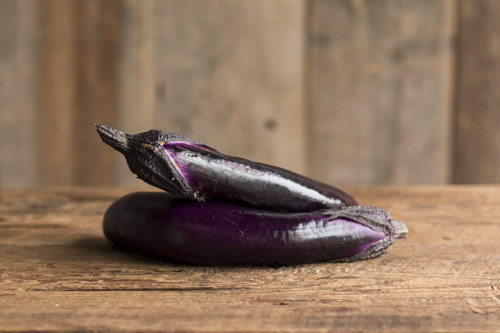 From Sanscrit, to Persian, Arabic and Turkish, European languages, and the United Kingdom, finding the root of the word eggplant is like a 5,000 year long game of telephone. Beginning as vaatingan in Sanskrit, becoming badanjan in Hindustani, then became badenjan in Persian! Most of the Arab world called them baadanjaan, [a select few, the ones who interacted most with the Italians, referred to them as melongena, which later became ‘melonzane’ in Italian]. From Arabic the baadanjaan became patlidjan in Turkish, badnjan in Georgian, berenjena in Spanish, beringela in Portuguese, and finally aubergine in French. 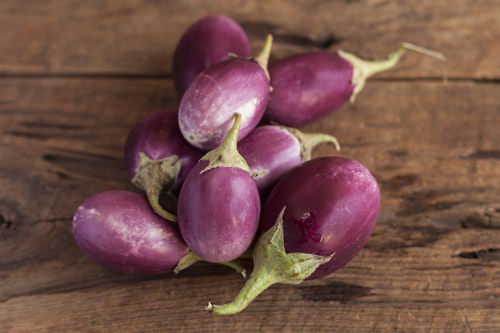 The reason we know this fruit as “eggplant” is because English colonialists in India during the 18th century who upon finding a small white globe variety of the veggie named them after the hen’s eggs they looked so much like. 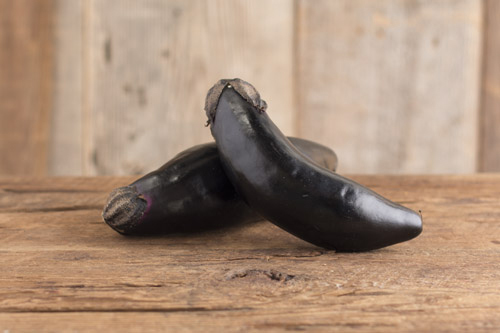 Although your standard American supermarkets may only feature the American variety of eggplant, many varieties are growing healthy and strong across the country, especially here in California. When you shop at GrubMarket, you can try a wide variety of these International superstars. Check out some of our favorites that are coming up this season! This American eggplant is distinguishable from its foreign friends by its round pear shape. 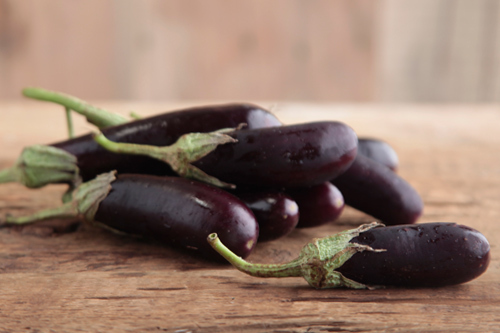 The eggplant is mild-tasting with a meaty texture that’s very low in calories. 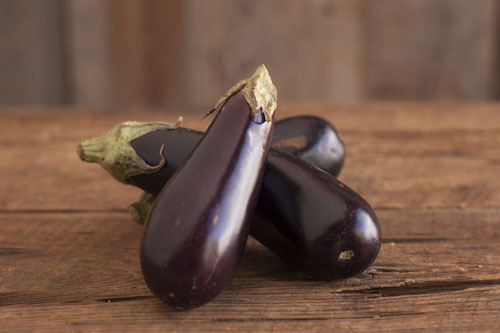 Not only will Eggplant keep you feeling great, but it makes you look great too! These purple beauties are loaded with vitamin C which helps give you a glowing complexion.